Do you like DIY or game enthusiasts? 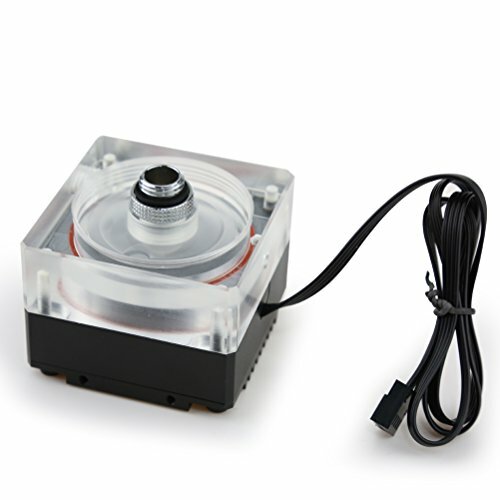 Our CPU Cooling Water Pump PWM for PC water cooling System maybe is a good choice for you. ❤Diameter of inlet and outlet: G 1/4"
2. When blocking, long-running is not allowed. 3. Preventing any hard particles entering the pumps. 1 year Warranty. If you have any questions please feel free to contact us! ❤Our water cooling systems are better than ordinary fan cooling, High performance, Designed around anti-vibration rubber mounting system. running speed can be increased by 50%, making the picture more fluid and better extension. ❤Featuring a 50,000 hour MTBF (5 year lifetime), this pump contains only one moving part: the magnetically driven graphite bearing spins on a single ceramic bearing, therefore extending the life of this pump beyond existing standards. ❤The pump is completely plug-and-play and can be directly connected to the computer power-supply with a standard 4 pin power connector. in addition, the pump speed is variable by changing the different model on Motherboard PWM control. ❤Quality acrylic glass top, CNC machined surface.The pump enclosure is made of aluminum alloy, unlike other plastic bottom shells only for a reduced price. If you have any questions about this product by P.LOTOR, contact us by completing and submitting the form below. If you are looking for a specif part number, please include it with your message.